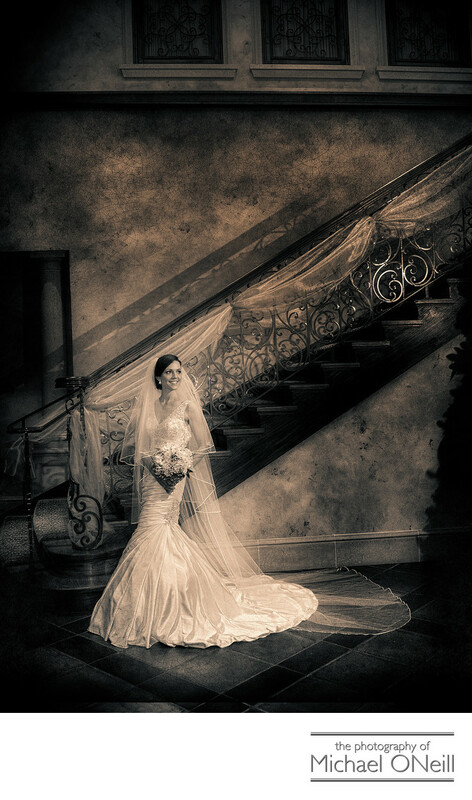 Another fine picture taken by the grand staircase in the lobby of Larkfield Manor in East Northport, NY. Located just a couple of minutes from my Larkfield Road wedding photography studio, I have photographed more weddings at Larkfield Manor than I could ever remember. You see my studio has been located on Larkfield Road since 1984 and I am probably one of the most experienced photographers anywhere when it comes to taking pictures at a Larkfield Manor wedding. This picture was taken on Thanksgiving weekend a year or two back. The main lobby was decorated beautifully for the Christmas holiday season. The bride was looking for an elegant vintage look in some of her wedding pics so I processed this image with an old-fashioned sepia tone and added a texture to further the vintage look and feel of the image. If you look around my web site further you will see many pictures from weddings at this establishment. From the grand staircase pictured here, to the awesome gazebo in the courtyard, to the meticulously maintained gardens with bridges over the reflecting ponds...Larkfield Manor offers the ultimate in photo opportunities for any wedding, any time, any season. If you are planning a Larkfield Manor wedding take the three minute ride north on Larkfield Road and visit me at my photography studio and gallery. I would love to sit down and talk to you about all of your plans for your perfect wedding day.